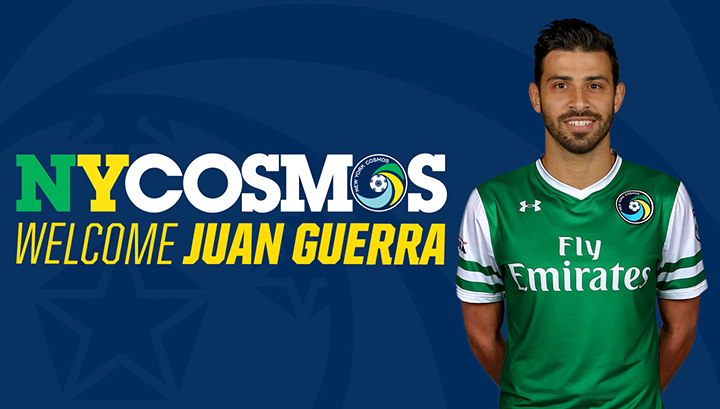 The New York Cosmos announced today the signing of midfielder Juan Guerra. As per club policy, terms of the deal were not disclosed. “I am very excited to join the New York Cosmos,” said Guerra. “Not only is this a historic club where some of the greats have played but also because of Gio. His teams have always been very difficult to play against and I think I can contribute to the Cosmos style of play,” he added. Guerra, 29 started his playing career at Florida International University in Miami followed by a short stint at the Brooklyn Knights in the USL PDL. In 2009, he moved back to his native country, Venezuela, making stops at Monagas, Caracas, Carabobo and Deportivo Lara. During his time at Caracas he had year-long loan spell at La Liga side, Las Palma. In 2015 Guerra returned to the U.S. joining the Tampa Bay Rowdies ahead of their 2015 season. “I’m very pleased that Juan will be joining us” said Cosmos Head Coach and Sporting Director Giovanni Savarese. “He is a very experienced player and has a strong presence on and off the field, which is just what we need in our midfield,” continued Savarese. Guerra played a leading role at the Rowdies where he made 45 appearances, scoring three goals over two seasons. He played for the Venezuelan national team in 2011, making eight appearances.